It’s a New Paper Day today! Go check it out at the new open access journal FACETS! An alternate title I kicked around for this paper was “Victoria thinks about Ankylosaurus for a while: What does she know? Does she know things?? Let’s find out!”, because in the end this represents lots of little odds and ends about the most famous of ankylosaurs accumulated since about 2008 until they felt like they gelled enough to make a proper paper out of. 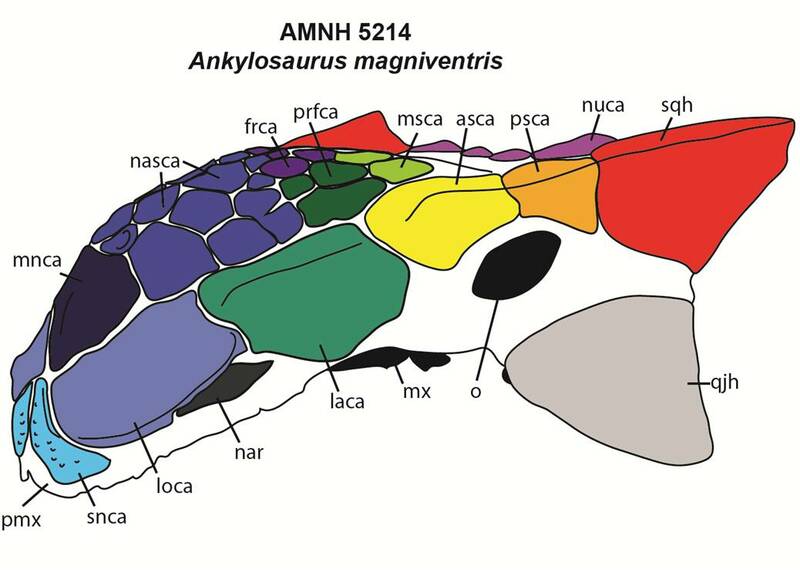 In this paper, Jordan Mallon and I tackle some of the more frustrating aspects of Ankylosaurus: what does this animal really look like, what’s up with its weird giant skull, and how did it live? Here’s a copy of the World’s Fair Ankylosaurus at the Royal Alberta Museum before the museum’s move to the new building – I know it’s partner the Corythosaurus has moved to Jurassic Forest, but I’m not sure where this guy is winding up! Maybe he’ll be at the new RAM? Despite Ankylosaurus being one of the most famous dinosaurs (it was one of the Sinclair World’s Fair dinosaurs, after all! ), it’s really not known from very many specimens. While its slightly earlier relatives Euoplocephalus and Anodontosaurus are known from multiple skulls and skeletons, only three good specimens are known for Ankylosaurus (unless someone out there has a secret one in their collection that I don’t know about!). AMNH 5895 is the holotype, and has the most complete postcrania, no tail club, and the worst skull. AMNH 5214 is the best skull, the only known tail club, and is also the smallest specimen. And CMN 8880 is represented only by cranial material, but is absolutely colossal. Ankylosaurus is the ankylosaur I am most often requested to consult on for various media projects (weirdly, the runner-up is Edmontonia, despite it being a lesser nodosaur), and it’s a dinosaur that shows up in lots of art and documentaries. Back in 2008 I helped out with the Ankylosaurus for Clash of the Dinosaurs, and I’m pretty sure that model was subsequently re-used for Last Day of the Dinosaurs (which features a hysterically outrageous ultimate showdown between Ankylosaurus, Triceratops, and Tyrannosaurus that’s a must-see, but warning, it’s gross). And most recently, the good folks at Saurian asked for my input on their Ankylosaurus. Despite the popularity of this species, it’s really hard to get a good handle on Ankylosaurus – there are no specimens with the osteoderms in situ, it’s got some weird proportions, and all of the specimens are very fragmentary. 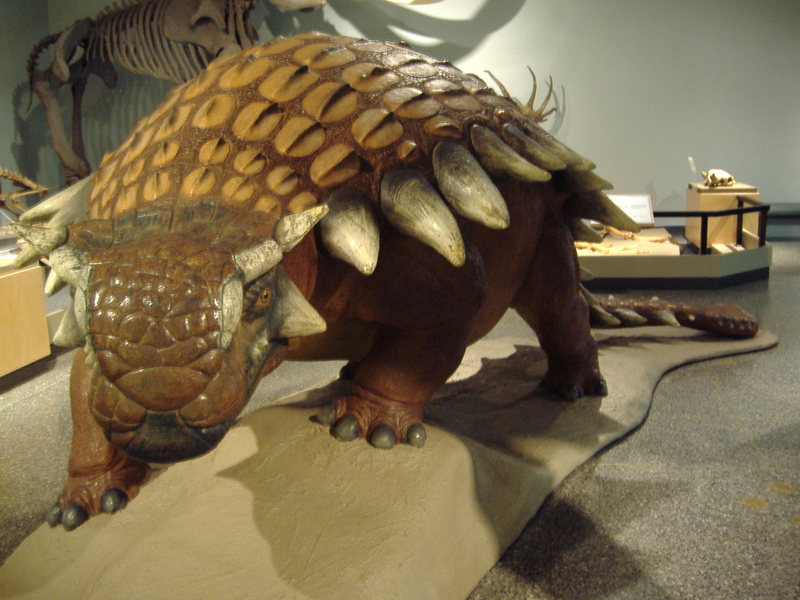 Several authors have explored the anatomy of Ankylosaurus, and in particular Ken Carpenter provided a great overview of the known skeletal material in a 2004 Canadian Journal of Earth Sciences paper. Nevertheless, this was a good opportunity for me to revisit what I’d observed over the years and try to come up with a really good reconstruction of this dinosaur, so I dug out all of the photos and papers I’ve accumulated over the last decade and took a stab at refining Saurian’s initial model. You can read a bit about the process in this blog post from last summer! The result is, in my opinion, the most convincing reconstruction of Ankylosaurus out there right now, complete with a best-guess armour arrangement based on more complete specimens like Saichania, Pinacosaurus, and Zuul, scales based on skin impressions from Albertan specimens, and new interpretations of things like the cervical half rings in the original Ankylosaurus specimens themselves. The final full-colour render has a lot of personality and I’m looking forward to playing the game as this species in the future! Assisting with this digital model made me realize that it was probably time to publish an updated hypothesis of Ankylosaurus armour, and so here we are! I’m sure this won’t be our final view of Ankylosaurus, and hopefully as we get more specimens future palaeontologists will be able to build on this work as we’ve done here. I’m really happy with this art-technology-science collaboration, which was both a fun project and also scientifically illuminating. You can follow Saurian’s updates on their Ankylosaurus model, which will be a playable character a bit further down the line, as well as more information about their interactive Hell Creek ecosystem, here. Elsewhere in Ankylosaurus, how about that weird giant skull? Ankylosaurus shares a lot in common with Laramidian ankylosaurins like Euoplocephalus, Anodontosaurus, and Zuul, but when it comes to the nose Ankylosaurus is doing something very different and weird. Instead of having forward-facing nostrils, the nostrils are pulled backwards and roofed over by cranial ornamentation so that you can’t even see them when you look at the skull face-on. Why has Ankylosaurus done such a weird thing to its face? We can’t say for sure, but when we look at other animals with somewhat similar faces, the closest comparison we could come up with were the unusual subterranean amphisbaenians and scolecophidians. Some of these lizards have narial openings that look a lot like those of Ankylosaurus, broadly speaking. Ankylosaurus wasn’t a fossorial, burrowing dinosaur – but maybe it was foraging around in the earth, eating tubers, roots, and insects, instead of relying more on ferns and leaves for its diet. It’s speculative for now, but I think there’s still a lot to investigate around ankylosaur diets! Why the weird face, Ankylosaurus? See how the nostril is located pretty far back on the side of the skull? The turquoise ‘mustache’ represents the ornamentation that usually forms an arch above the nostrils at the front of the snout. Finally, let’s talk about the giant size of Ankylosaurus. The smallest skull of Ankylosaurus, AMNH 5214, is already a pretty big guy – much larger than any other ankylosaur skulls, even relative big ones like Zuul’s. But the largest skull, CMN 8880, is gigantic. It takes up an entire wood pallet in the CMN collections, and is about twice as big as most other Laramidian ankylosaurins. So just how big was Ankylosaurus? Previous estimates have put it in the range of 6.5 – 7.5 m long. Scaling the known skeletons of Ankylosaurus to more complete ankylosaur skeletons gives us maximum lengths up to an incredible 10 m! Only more complete skeletons can help us fully resolve this question, but given that Zuul’s skeleton is about 6 m long at minimum while the skull is substantially smaller than those of Ankylosaurus, I think a large Ankylosaurus in the range of 8-9 m isn’t an overestimate. Truly, the Hell Creek was a time of dinosaur behemoths. A tail club is only known for the smallest Ankylosaurus, which led me to wonder just how large the tail club knob could get in this species. Anodontosaurus has one of the largest known tail club knobs for any ankylosaur, at 60 cm in width, yet the largest skulls are only half the width of CMN 8880 – thus, scaling the knob based on skull proportions between these two species would yield an Ankylosaurus maximum knob width of 120 cm, which must surely exceed some threshold for mass you can support at the end of a long tail. On the other hand, scaling between Ankylosaurus specimens yields a knob width for CMN 8880 of about 57 cm, which is similar to the largest known tail club knobs from Alberta and Mongolia. So, despite the large difference in skull size for Ankylosaurus, it seems like tail club knobs may have topped out around 60 cm in width, which is pretty interesting. Ankylosaurus tail clubs: surprisingly not that big! On the left is the biggest Anodontosaurus tail club AMNH 5245, and on the right, the only known Ankylosaurus tail club, from AMNH 5214. There’s lots more to dig through in this paper, so I hope you’ll go take a look for yourselves! And Jordan was even able to swing getting some fancy 3D scans of the giant CMN 8880 skull that you can download for yourself at MorphoSource – enjoy! How great that you gave this magnificent beast its due! What is your opinion on his hypothesis as an ankylosaur expert? So why were the nostrils of Ankylosaurus located laterally instead of anteriorly? Coombs and Maryanska suggested this was related to diet but didn’t elaborate. AMNH 5214 is the only known Ankylosaurus club? Some time ago Wroblewski reported one from the Ferris and an amateur found one from the Hell Creek. I looked into the Wroblewski reference you mentioned and it seems to be an SVP abstract – unfortunately, that makes it really hard to assess whether or not the specimen belongs to Ankylosaurus. Maybe at some point those specimens will be published in full papers! The fragmentary Ferris club is UW 26294, referred, like other specimens, to Ankylosaurus on the basis of size. Teeth from that unit are said to resemble those of Ankylosaurus not those of Euoplocephalus. Btw some time ago, in the fossil forum, an amateur collector showed a pic of an Ankylosaurus club, from the Hell Creek, around the same size as that of AMNH 5214. Getting back to diet, ankylosaur teeth were weak but they compensated with big guts, accomodated by wide bodies. I don’t think a massive, 8-10m animal could’ve subsisted on tubers and roots (much less have been a coprophage or nest raider). Long ago I speculated that, just as the large size of Ankylosaurus (like that of some contemporary herbivores) enabled it to withstand T. rex, the position of its nostrils was also related to defense. We don’t have any feet directly from Ankylosaurus itself, but what if their feet did have fossorial adaptations? Maybe not entirely fossorial, but perhaps at least more so compared to other ankylosaurs. Its armor plates are flat and smooth instead of spiky like in other ankylosaurs – perhaps an adaptation to reduce drag against burrow walls? Not to say that it’s making complex communal tunnel systems, but maybe making itself a burrow for shelter when necessary. Sort of like modern tortoises. I think it would be interesting to look at fossorial adaptations in more dinosaurs, and also take a look at maximum sizes for burrowers! Not too sure that the lower armour on Ankylosaurus is in response to burrowing behaviours, but it’s a fun thought experiment! I can’t see Ankylosaurus as a fossorial animal. What animal its size burrows today? I presume tortoises make burrows to escape heat (maybe Lystrosaurus survived the end Permian crisis by burrowing to evade excessive heat due to CO2 output from Siberian trap volcanism). But the Ankylosaurus environment was far from a hot desert. AFAIK not even Mongolian ankylosaurs are known to have burrowed. Big animals don’t overheat so quickly as small ones. Of course a burrow can serve some purpose other than evading heat; it can be a refuge from enemies. But from head to distal tail ankylosaurian bodies evolved to withstand attack. Why would all that be selected for if there was another means of defense? I’d say modern day bears come pretty close to average ankylosaur sizes, and the large polar bears, grizzlies, and black bears make dens to hibernate. Burrows form microclimates that tortoises find favorable, and they do indeed help tortoises escape heat and other harsh environmental conditions, but I’ve also learned that ideal humidity inside the burrow is one of a number of factors that help promote carapace health. The same might go for Ankylosaurus, which may also then extend to ankylosaurians in general. As for burrowing for additional protection, I actually have this crazy idea relating it to possible ankylosaur ontogeny. This is gonna get really in-depth, so hold onto your butts! Or shall I say “tails”? Particularly that of AMNH 5214, with its unusual U-shape in the tail handle vertebrae compared to the typical V-shape in other ankylosaurids. And ZPAL MgD I/113, a separate species with tail handle vertebrae intermediate between the extraordinary U-shape and the classic V-shape. In a previous blog, someone suggested these morphological differences may indicate different growth stages, with the U-shape vertebrae in Ankylosaurus being a younger condition to later mature into the adult V-shape seen in other species. If this is the case, then Ankylosaurus as we know it so far may still have room to grow (perhaps AMNH 5214 represents a subadult or late juvenile individual). Mechanically speaking, I like to think that the U-shape in Ankylosaurus vertebrae allow a little more flexibility in the handle than with V-shaped vertebrae, making it easier to maneuver in burrows. Naturally, juveniles are less developed and more vulnerable than adults. Armor included. So younger individuals will desire more shelter than adults need, and burrows fit the bill nicely. There’s been studies on long bone histology in ankylosaurs, and they found extensive bone remodeling in many ankylosaurs, and even suggested that club-tailed ankylosaurids may have experienced bouts of temporary osteoporosis as they liberate calcium from their limbs to their osteooderms. This would make their limbs highly susceptible to injury during this process, something that large predators like Tyrannosaurus could exploit. Hence, digging out a burrow beforehand will provide juvenile ankylosaurs shelter from predators and perhaps environmental hazards while their limbs are so vulnerable. What more, what if they went dormant during these times, sleeping through these periods of bone remodeling that makes them more vulnerable otherwise? Modern bears don’t lose bone mass or muscle mass while hibernating, and their bones remodel during this time. If anything, their bones can actually get stronger during hibernation. Perhaps the same thing happened with growing ankylosaurids. What I’m suggesting is that Ankylosaurus and other juvenile ankylosaurids may dig themselves a shelter where they can safely sleep through their growth spurts. Once they’re fully mature, they’re well armored enough and no longer reliant on dormancy growth and the subsequent need for burrows, so the tail has room to become more rigid to better withstand mechanical stress. Hi Lam Luong. I was the one who made that suggestion about changes in handle vertebrae morphology being due to ontogeny. Notice though, that Victoria Arbour dismissed this suggestion in her Nov. 29 comment. Hey Tim – I think you might be misinterpreting our discussion about the ecology of Ankylosaurus! We aren’t arguing for a fossorial, burrowing lifestyle – Ankylosaurus does indeed seem to be too big to be fossorial, although I have heard that giant ground sloths also created giant burrows in the ground, so maybe there’s more to learn about size limits for burrowing. Instead, we’re arguing that the weird nose might (*might*) be related to some weird feeding behaviours, and that foraging for food in the earth might be an option. I just thought of something – the Hell Creek Formation had regular volcanic activity, yes? Meaning a lot of volcanic ash would fall over the Hell Creek environment? If so, then what if Ankylosaurus developed its rooting adaptations to brush through blankets of volcanic ash to uncover the ground vegetation buried beneath, with its laterally-pointed nostrils helping to prevent it from accidentally inhaling the ash? On that note, with volcanic activity fertilizing the land and super-charging plant growth, I’m thinking maybe subterranean growths like roots and tubers can also provide substantial or supplementary, nutrient-dense treats that Ankylosaurus are particularly fond of. And if grubs are also feeding on those roots, they’re growing just as largely on those nutrients, and thus in turn providing an even more valuable food item for Ankylosaurus. Or, maybe, Ankylosaurus is even pushing around mud to expose crustaceans and/or shelled mollusks. At least more so than other ankylosaurs, but still rather supplemental to a largely herbivorous diet. We have evidence of hadrosaurs eating crustaceans, speculated to obtain enough calcium and protein for egg production. Ankylosaurus would benefit from these food items to promote proper bone health, particularly its protective osteooderms, and the wetlands of the Hell Creek Formation provides an abundant supply ready to exploit. I saw where the paper states that Ankylosaurus wasn’t fossorial. My previous post was a reply to Lam Luong’s comment of October 28 (above). Sure, nostrils in lateral positions might’ve facilitated breathing if Ankylosaurus stuck its snout into the ground in search of tubers, roots and insects. But I have doubts. The animal seems too big to have subsisted on such food. And there shouldn’t have been any need for it. Presumably, even in Mongolia, there was plenty of vegetation above ground. I think the lateral placement of the nostrils was related to defense. Note that ankylosaurs facing the greatest tyrannosaurs–Saichania, Tarchia and A. magniventris–had armored premaxillae. By the time of T. rex, the threat had become so great that defense of the skull anterior had to be maximized. Since the nostrils were “pulled backwards” the front of the upper jaw could consist of just armor (no openings to reduce the integrity of its defense). Being “roofed over by cranial ornamentation” also suggests heightened defense. In other words, the nostrils were moved out of harms way, since the anterior part of the skull was relatively low, hence easier for a tyrannosaur’s jaws to grasp. Of course all ankylosaurs probably turned to deny a tyrannosaur access to the head, but attacks couldn’t always be prevented. Predators often try to kill by crushing or fusing breathing pathways, causing suffocation. Tyrannosaurus was probably best able to do that, so a rather “extreme” defense might be expected…. I think it might be helpful to pull back a little bit here and look at the broader ecosystem. I don’t think we should frame all adaptations around Tyrannosaurus – there were many other aspects of the Hell Creek ecosystem that might have influenced the evolution of the animals within that ecosystem. Tyrannosaurus is cool, but it’s not the only predator in the ecosystem, and food acquisition is a super important selective pressure! Certainly Tyrannosaurus wasn’t the only predator in the ecosystem but it was the only one capable of threatening Ankylosaurus. Of course food acquisition is important. But is there any specific data on coeval vegetation that would cause digging to be selected for? I’m under the impression digging for tubers occurs in environments where above ground food is scare, such as a desert. Not something which seems particularly likely in the lush environments of LK Laramidia. It’s unclear to me why Ankylosaurus would be adapted to digging while no previous ankylosaur in that region was, nor any in Mongolia where in theory the need might’ve been greatest. I’m not aware of any big environmental change in the late Maastrichtian of Laramidia with a bearing on ankylosaur evolution except T. rex. It’s advent required escalation reflected in the larger sizes of contemporary herbivores, and size wasn’t the only requirement. Another great article thanks for your continued work on the ankylosaurines, they really needed some attention. I’ve been curious on ankylosaurine sizes for some time and Carpenter’s estimate seemed too small for me for Ankylosaurus, it would be too disproportional compared to other “Euoplocephaluses”. Ankylosaurus is the only ankylosaurine (for now) with these nostrils, but the fossorial capabilities are for other ankylosaurines too. It may be a further adaptation for that but if they were fossorial in some kind the other ankylosaurines were doing fine anyway. I wonder if the horns of Ankylosaurus were used for defense. I think the ankylosaurine horns are mostly for display but Ankylosaurus’ are very big and thick. I don’t know how would the skull deal with Tyrannosaurus’ powerful jaws? Looks sturdy enough but I don’t know. The horns could have been some dissuasion to attack the head or neck. I remember reading somewhere that Ankylosaurus had a (minimal) degree of binocular vision. Is this true? I don’t think it is significant or has a purpose if it really is small as it looks at untrained eye, just curious. As for the burrowing stuff. The sinuses have been proposed also to be an olfactory improvement solution. This would make sense for an animal that searches for underground food. But other ankylosaurines also have sinuses and have frontal nares so it’s not clear. IIRC it has been shown that ankylosaurid had a good sense of smell, I know you scanned Ankylosaurus’ skull so I am expecting you to see a very big olfactory lobe. I have another question: is there any evidence to prove or disprove an armoured eyelid in Ankylosaurus? Based on the presence of eyelid osteoderms in its close relatives (Euoplocephalus, Dyoplosaurus, Anodontosaurus, and Zuul), I think there’s a pretty good chance that Ankylosaurus had them as well. Maybe we’ll see them inside the skull of CMN 8880 if we get a chance to CT scan it! How could Ankylosaurus POSSIBLY have had binocular vision?? Maybe you’re confusing it with T. rex. 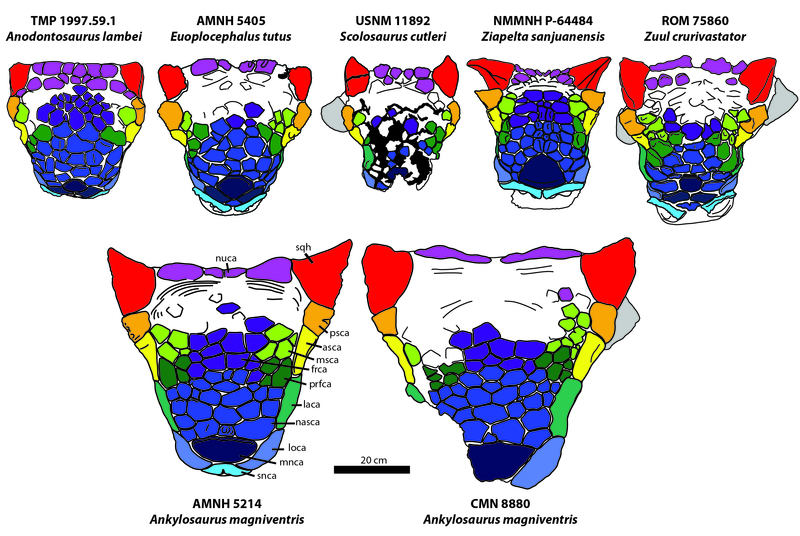 Ankylosaur head horns almost certainly evolved for defense. A tyrannosaur sought to bite or crush the head. Ankylosaurs turned to avoid attacks on the head but the tyrannosaur might catch it anyway, so backwardly projecting horns helped deter attack from the direction it was most likely to come from during a confrontation. Lam Luong: Sure Laramidia had volcanic activity. Eruptions weren’t in the Hell Creek floodplain itself but in the area of orogeny farther west, deeper in the interior and probably closer to the real habitat of Ankylosaurus. But I very much doubt this was a factor in the lateral placement of its nostrils. Eruptions aren’t continuous and usually affect only limited geographical areas–in which much of the local fauna is killed…Suppose there was a significant eruption every 100 or 200 years. Most Ankylosaurus individuals would probably never experience such an event. For those that did, its affects would be felt for only a few years–that is, for individuals that lived to see them, in the part of the taxon’s range where the event occurred. Can you cite any analogs (modern eruption-adapted large herbivores) in support of your view? Whereas an eruption (like a drought, flood, or impact) was a rare event, and usually of no longterm relevance, T. rex was an almost CONSTANT presence. From the tip of its cranium to the end of its tail, an ankylosaur was adapted to withstand attack. By the time of T. rex this need had become acute. A defensive purpose for the shift in nostril position–occurring in conjunction with extra armor–seems most likely to me. Thanks for your share, i like Ankylosaurus very much. I think the Ankylosaurus is very beautiful!